• Nineteenth century Scottish painter David Robert’s painting, The Forum, is at the heart of a new display at the Guildhall Art Gallery exploring the concept of the Roman forum. The display looks at why the forum played such an important role in the Roman world, how it would have looked and what happened there. It also examines the painting in the context of the Robert’s Roman series, his wider body of work and depictions of the ‘grand tour’ by other artists. Admission is free. The exhibition, which is part of Londonium, a series of events, talks and displays focusing on London’s Roman past, runs until 1st January. For more, follow this link. 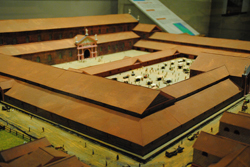 PICTURE: A model of Londinium’s Roman forum in the Museum of London. • Two young Londoners who were posthumously awarded Victoria Crosses after they were killed on the first day of the Battle of Passchendaele have been honoured with commemoration stones in Victoria Embankment Gardens. Captain Thomas Riversdale Colyer-Fergusson, accompanied by a sergeant and just five men, managed to capture an enemy trench and a machine gun which he turned on his assailants. The 21-year-old attacked again, this time with just his sergeant, and captured another enemy machine gun but soon afterwards was killed by a sniper. Second Lieutenant Dennis George Wyldbore Hewitt, meanwhile, led his company under heavy machine-gun fire while seriously wounded and in pain. The 19-year-old successfully captured and consolidated his objective but he too was killed by a sniper soon after. The two men died on 31st July, 1917. The memorials were erected as part of World War I centenary commemorations which is seeing all 628 Victoria Cross recipients from the war being honoured in their birthplaces. • On Now: Samuel Fosso: Self-portraits. This exhibition at the National Portrait Gallery features a selection of images from 666 self-portraits taken by Cameroonian-born artist Samuel Fosso in 2015. Each of the shots were taken against the same red backdrop with Fosso adopting an identical head and shoulders pose in each. Photographed every day during October and November, 2015, each work is intended to reflect Fosso’s particular mood at that moment. The photographs, the artist’s first solo display in the UK, are displayed alongside some of the earliest self-portraits that he made while a teenager working in Bangui in the Central African Republic in the 1970s. In these works, Fosso adopted personas which reflected popular West African culture, from musicians and the latest youth fashions to political advertising. He employed special cloth backgrounds, in front of which he dressed up in a range of outfits from authentic European costumes and African folk costumes to navy uniforms, karate keikogis and boxer shorts. Runs until 24th September. Admission is free. For more, see www.npg.org.uk.